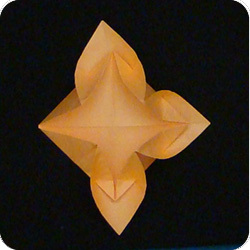 This origami water lily is a traditional model – this means that it has been around for so long that no one knows who invented it. You would think that such a flower would be dead easy to make given that it has been around for who knows how long. Not necessarily so. 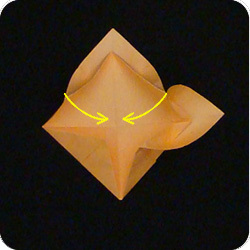 This model consists of three blintz folds (easy) and an inversion (not easy). The inversion part is tricky and you have to do it four times! Are you up to the challenge? 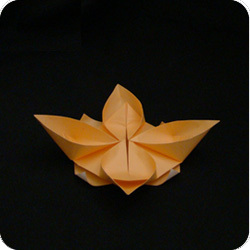 Let’s see how well you fare with this origami water lily. 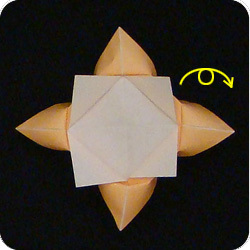 Fold the paper in half (top to bottom) and unfold. 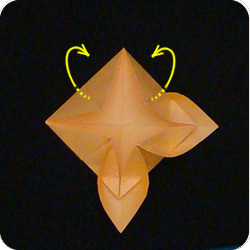 Fold in half again (left to right) and unfold. 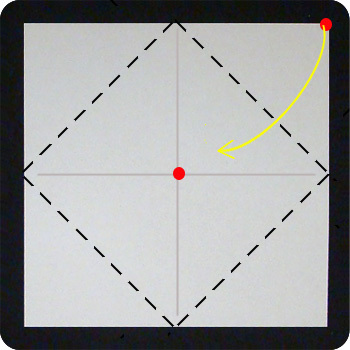 This gives you an “+” shaped crease. 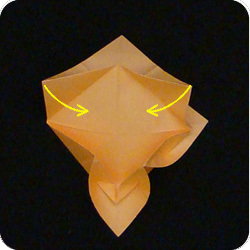 Do the first blintz fold. 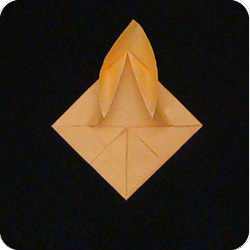 A blintz fold is when you fold the four corners of the paper to the center of the paper. 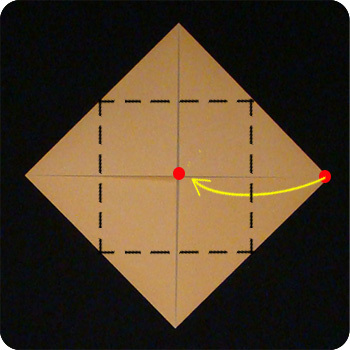 Perform a second blintz fold: fold the four corners to the middle again. 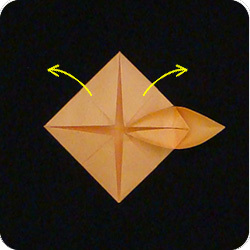 Perform the third blintz fold: fold all four corners to the middle. 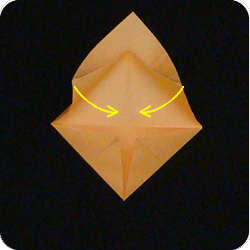 Here, the paper is getting a bit thick so take care to make crisp folds. 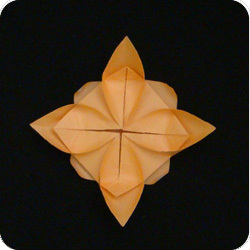 The next few steps are for making the petals. Partially unfold the two top flaps. From behind, lift and invert the flap of paper so it comes forward. It helps if you run your finger nails along the dotted line. 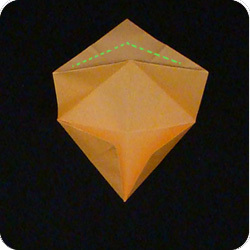 This will guide the paper during the inversion. Bring the two flaps back down. 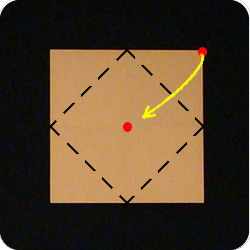 Do this by pulling the two corners together. …done. 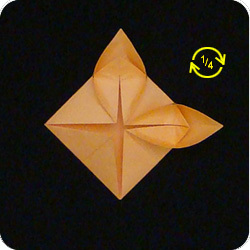 Turn the model quarter turn clockwise and repeat. 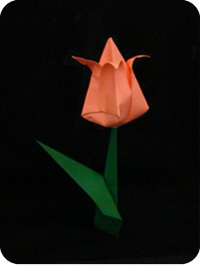 Work on the second petal. 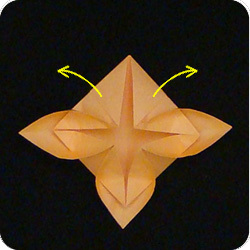 Partially unfold the top two flaps. 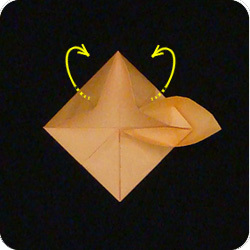 Fold up and around a flap of paper from behind towards the front. 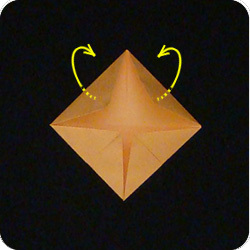 Bring the two flaps back down by pulling the two corners together. Second petal is done! 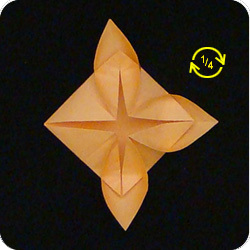 Rotate the model quarter turn clockwise and keep going. Let’s work on the third petal. 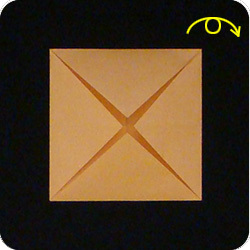 Invert the paper from behind towards the front. Bring the two corners together. done. Quarter turn clockwise to make the last petal. Bring all 4 points together. Wait, you’re not quite done yet! Turn the model over. 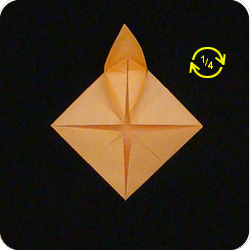 Peel back the paper as far out as it will go. These will be the second tier of petals. 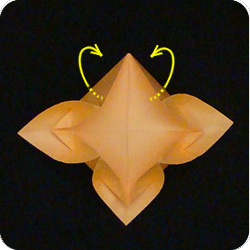 Top view (left) and side view (right). 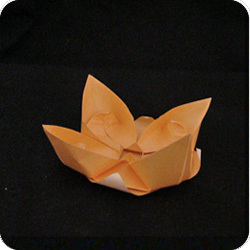 There’s a lot you can do with this origami water lily. 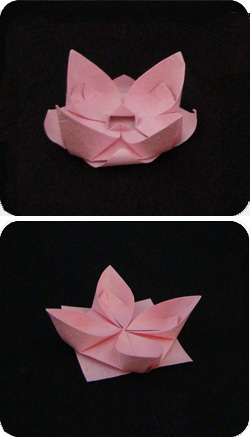 Left: You can pull the petals up towards the sky so the flower looks more like a bowl rather than a plate. 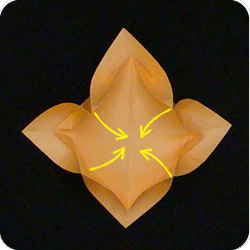 Below: You can also curl the various flaps so they appear more like curled petals. 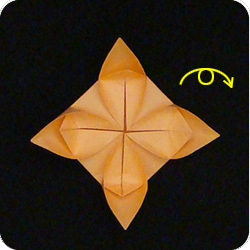 First panel shows flower right after it has been made. 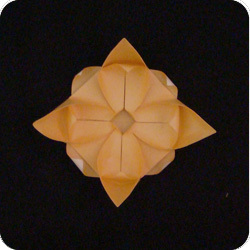 Second panel shows the inner petals molded so they are round and curvaceous. 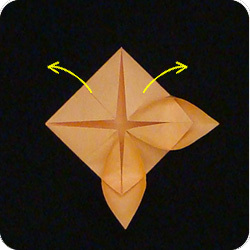 Third panel shows the outer petals after they have have been twirled around a pencil or a wooden skewer . 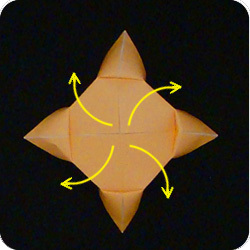 Last panel shows the tips at the center of the model folded up. In the flower above, I used harmony paper . 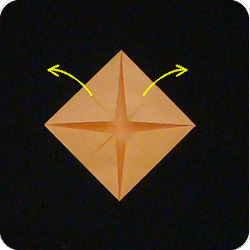 Harmony paper is origami paper which changes color as it extends from the center to the edges of the paper. This gives the water lily different colors: white for the outer layer of petals, green for the main petals, and blue for the central core.